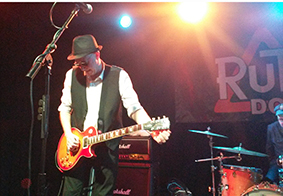 Audio heaven last night in the form of live act Ruts D.C. a three piece punk/reggae band that have their roots firmly entrenched in the enclaves of punk history. Originally The Ruts, their adroit merging of punk and reggae/dub in 1981 ensured their place in music history – that and the fact that they got regular playings on The Peel Sessions with infamous experimentalist DJ John Peel not only playing their music but helping the fans to obtain their tracks when few record shops stocked their albums. The D.C. is short for ‘de capo’ which is Latin for ‘from the beginning’. 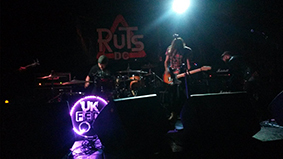 Performing to a packed crowd their support band UK Feds were much rawer live than their youtube videos would have you believe – they are a Birmingham punk/ska band with an impressive backlog of supporting Adam Ant and now Ruts D.C. Formed in September 2015, (yes last month) these Midland musicians are Jon Kings (lead vocals/guitar), Ryan Kings (vocals/bass), Ricky-Lee Cooper (drums) and second guitarist Mikey Rainsford. Intense, sharp sociopolitical songs like, ‘Minimum Wages’, and ‘Trouble in London’ engage an audience that want an intelligent response to their ‘Anger’. These musicians sing about the essence of the ‘stuff going on in the world that affects us, just like bands in the 70’s and 80’s did.’ The two guitars on set gave an extra kick to their loud delivery and they were a real treat to see because they were so fresh and passionate. When Ruts D.C. came on after the soundcheck the crowd had already taken their surge forward. I’m now proudly wearing a ring of bruises round my right leg from the stage edge as I managed to get front row and befriend two females to dance with – it was a testosterone-heavy night. Best workout ever – almost 2 hours of non stop dancing to Ruts classics ‘Babylon’s Burning ’, ‘Jah War ’, (which was a response to the Southall disturbances of April ’79) and ‘Staring At The Rude Boys’ amongst the highlights. Their eighteenth gig out of a thirty one gig ‘Psychic Attack Tour’ that started in Muster, Germany late September and finishes on the 5th December in Blackpool was a testament to the energy of singer/bassist John “Segs” Jennings, drummer Dave Ruffy and guitarist Leigh Heggarty who, though heavy weights themselves, have recently played with Rancid, Buzzcocks, Goldblade, Social Distortion, Public Image Ltd and reformed Anti-Pasti. Great venue and legendary act made for an intimate experience that ticks all the boxes.